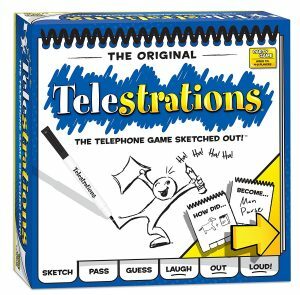 If you haven’t heard of Telestrations before, you’re definitely in for a treat! Hands down, this is the most fun party game out there. It’s one of those games that has everybody laughing and you don’t need a certain type of humor or personality to like this game – which is rare nowadays. All ages can play this game too. I played with people 22+, but I would imagine it would be practically the same with anyone. In my opinion, it even beats Cards Against Humanity! Sorry, I know that’s a huge crowd favorite, but the cards can get old after a while. 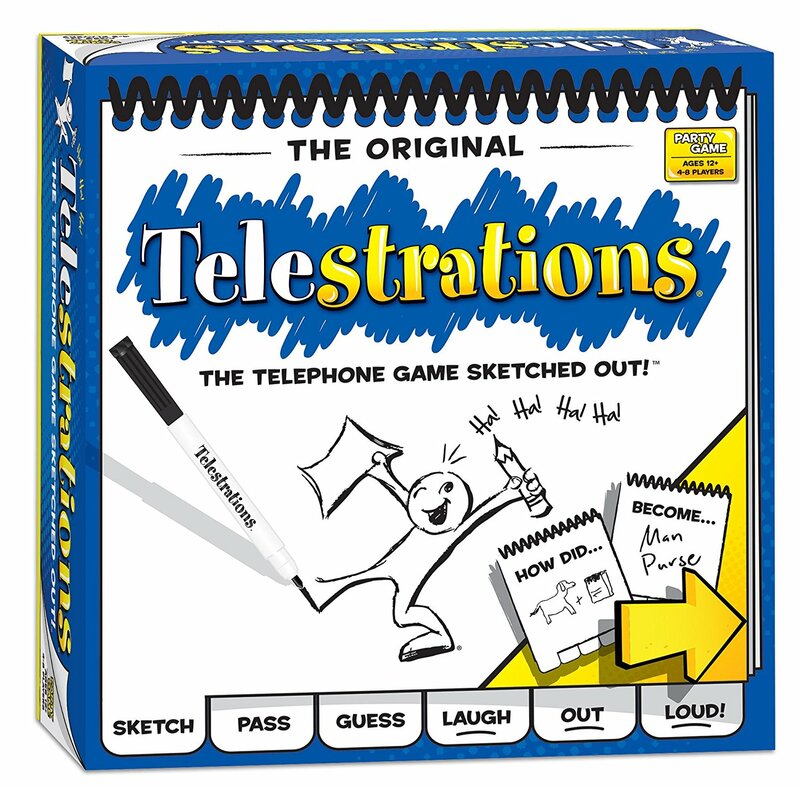 Telestrations is most comparable to telephone, but with pictures. Do you remember when you would play telephone as a kid? It would start off as something like “Joe walked down the street to get a sandwich,” and by the time it got to the final person it would turn into, “Going down the street to marry a sandwich” or something even wackier. Everyone would laugh and wonder how it turned into something far beyond what it was originally. “But I thought you said marry? !” No. Just no. Telestrations is that exactly. You are given a word to draw – let’s say it’s ‘dalmatian.’ You draw what your interpretation of the word is and pass it on to the next player and then they have to guess what you drew. They hand it off to the next player who draws that word and so on and so forth until it goes around the circle back to you. What started off as a simple dalmatian can be turned into a hot dog on fire. Yes, even the most basic of drawings can go horribly wrong, but that’s truthfully the best part. It seems pretty straightforward, right? The nice part about this game is no one wins and no one loses. It’s not a trivia game where whoever has the most knowledge wins. That’s a huge bummer on your self esteem. Actually, the worse at drawing you are the more fun the game is, so you definitely don’t have to be a Picasso. If you’re looking for an icebreaker game this is the perfect one and it isn’t complicated. It’s a party game that literally anyone can enjoy and it will bring people together, close friends or not. Playing the game will ease some tension and will get everyone laughing almost immediately. Anyone can jump in at anytime and the game can end whenever everyone agrees it’s over. Everyone’s variations of drawing words are the most entertaining part of the game. Each player will have their own style and interpretations of what they think it is — what may look like a butterfly to you could look like something completely different to someone else. Some of the drawings and guesses will be ridiculous and will make absolutely no sense, and that’s kind of the point. You never know what to expect when you play. Will your butterfly stay a butterfly or it will it turn into a flying robot? WHO KNOWS? The only rules of this game are to draw something and have the capacity to laugh. Later on you can reminisce about the game and all the drawings that somehow went terribly wrong. The game comes in packs of 6, 8, or 12. Your drawings will be funnier and more outrageous the more people you play with so I recommend getting the 12-player version for epic party gaming.